ALAMINFOTECH: HOW TO GIVE A WONDERFUL FEET MASSAGE TO YOURSELF? Human feet are among the easiest parts of a human body to self-massage. The massage can be done by simply sitting and resting one foot on the opposite thigh. This way one foot can be given a complete massage followed by an identical massage with the other foot. But before that, it’s advisable to soak the feet in a bowl of warm water to which oil (lavender or peppermint oil) can be added. For an effective feet massage, you need to abide by certain requirements. Place right foot’s sole on the left knee in a resting position. Then sandwich the foot between your hands with the fingers facing forward. Then rub the hands backward as well as forward along the foot. This will help to warm the whole foot area. Place the left hand on the heel of the right foot to support it. Then clasp the toes with the right hand, squeeze it slightly firm and then extend and flex the toes to enhance their flexibility. Support the right foot with one hand’s fingers. Place one thumb on top of the other, using the fingers to support the foot. Then work over deep, circular thumb pressure over the foot’s sole and later stroke the area. Repeat the same process on the left foot. Under this method, you need a few things including warm water, wash basin, Epsom salts, body lotion, and golf or tennis ball. Soak feet in a tub of warm water for about 10 minutes. Then add ½ cup of Epsom salts to the water for extra relief. At the end of it, dry in a gentle way the whole of the feet with a clean towel. This should be followed by any one or all of the below workouts. Place a golf or tennis ball on the floor. Then roll the bottom of the foot all over it. Massage your foot that is on your lap with lotion (avoid oil since it does not glide well over the feet). Then use both hands to squeeze the foot all over. Later wrap the feet in a clean towel, allowing the foot lotion to soak in for a few minutes. With one hand, stabilize the foot and with the other hand, take all the toes and rotate them in a particular way followed by the other way. Later take each toe one by one and gently pull up and twist. Use thumbs to massage the sole of the feet from the heel to the toes in a circular motion. Then crisscross the thumbs to back down the sole to the heel. Place one hand on one foot’s top and likewise the other hand on other feet’s top. Then place the hands in a fist against the ball of the foot and slide both at the same time down towards the ankle. Take the back of the calf and grab it. Massage it up and down while making sure to flex the foot. Once done successfully, get into comfortable slippers. NOTE: Stop the process in case you feel anything painful. Immediately check with your doctor and find out if your ankles are swollen. If that is so, find out whether you have a kidney disorder or heart disease or advanced diabetes. Then later abide by your doctor’ advice. For the best quality genuine foot massager, buy Deemark Compact Foot Massager from CallHealth Services Pvt Ltd, a pioneering technology-powered and integrated healthcare provider. With three programs: Automatic, Individual, and manual, Deemark Compact Foot Massager is ideal for all age groups and both genders, especially effective for housewives, working professionals and elderly people. 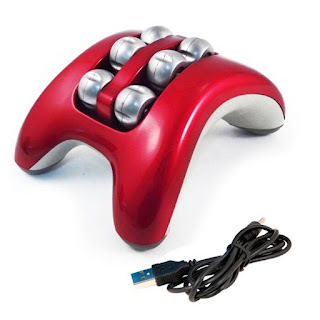 An automatic foot massager, Deemark Mini Massager with its clean design and extended functionality, helps drive away tension, relieve aches and pains and provide more energy to improve body flexibility. Easy to use at home as well as at office or gymnasium. Key feature: Press activated and then simply rest a foot on the massager. Smoothing vibration helps ease aches and tightness.